During the 20th century, up to 9.5 million tonnes of asbestos were consumed in Germany, with annual usage peaking around 1980 at 440,000 tonnes.1 Three decades later, thousands of Germans with asbestos-related diseases find themselves caught up in a bureaucratic nightmare which leaves the vast majority unacknowledged and unsupported. 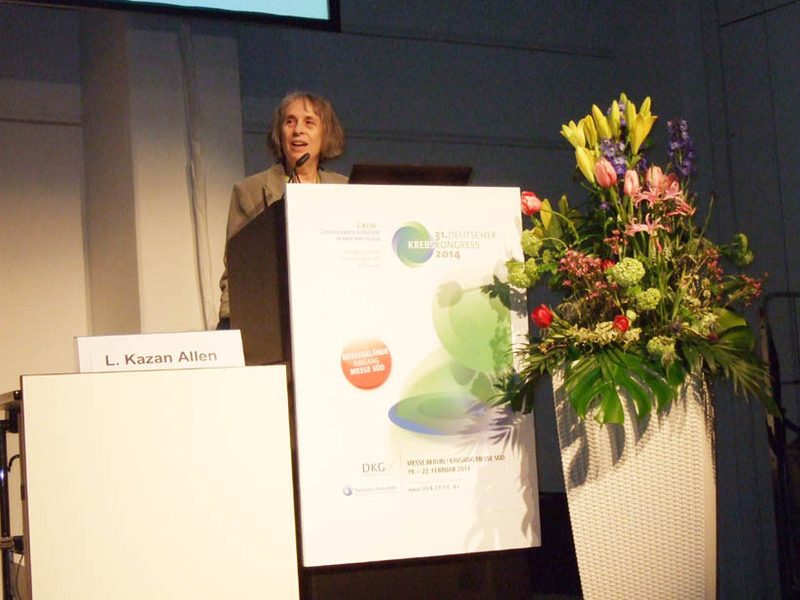 Considering the ubiquity of asbestos production and use and the lack of workplace controls, it is not surprising that hotspots like Bremen and Hamburg record high incidence rates of asbestos cancer; these cities, which have Germany's highest and second highest mesothelioma incidence rates, reported 8.3 and 4.5 cases of mesothelioma, considered the signature cancer associated with asbestos exposure, per 100,000 population in 2012. According to a publication by the World Health Organization (WHO) these figures are the continuation of a long-standing trend. The WHO's worldwide mesothelioma mortality database lists Germany as the country with the fourth highest number of deaths over the fifteen year period beginning in 1994.2 The German accident insurance institution has estimated that 190,000 of the country's 2,000,000 asbestos-exposed workers will contract asbestos-related diseases. This figure, which equates to less than 1%, appears ludicrous in light of the comment I heard from one medical expert in Berlin who told me that at a shipyard in Northern Germany where asbestos had been used, 100% of the workers had been diagnosed with asbestos-related diseases. These figures, as frightening as they are, underestimate the tragic reality. German experts report a huge underreporting of asbestos mortality data by German insurance schemes . One of the major barriers to compensation is the Berufsgenossenschaften (the German Employer's Liability Insurance Agency) which oversees a rigid administrative system that places unfair and untenable requirements upon asbestos claimants. Seven regional asbestos victims' groups, overseen by a national umbrella group  Asbestose Selbsthilfegruppe  are campaigning to shift the burden of proof from victims to exposers. 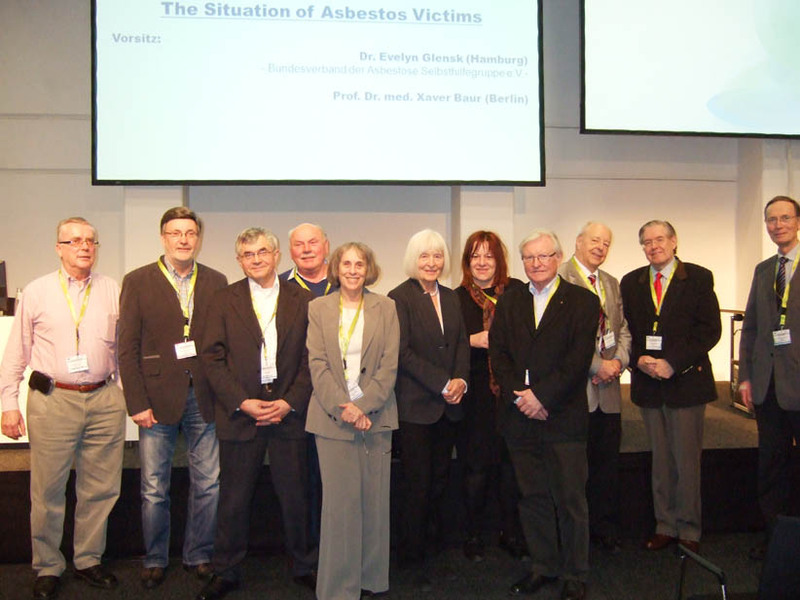 4 Last month, for the first time, the victims were offered the opportunity to hold a symposium, entitled The Situation of Asbestos Victims, within the framework of the German Cancer Congress. 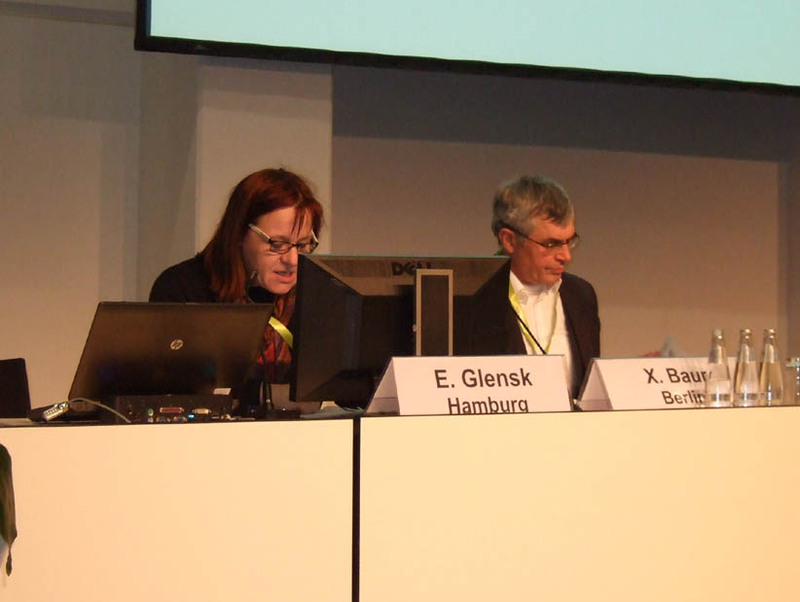 In the hour before the February 21st seminar, a press conference took place at which asbestos experts described the status quo and highlighted the failings of the German compensation systems. Prof. Dr. med. Ulrich Kleeberg, President of the Hamburg Cancer Society, and Dr. Evelyn Glensk, Member of the Board of the German Federal Association of Victims Groups (International and Public Affairs). Recognition of asbestos-induced occupational diseases without histology. Co-Chairs Dr. Glensk and Professor Dr. Baur. In the aftermath of the presentations, there was a lively debate during which asbestos victims questioned measures which not only blocked their access to compensation but also abused their human rights, such as the need for lung biopsies to verify an asbestos patient's entitlement to compensation. 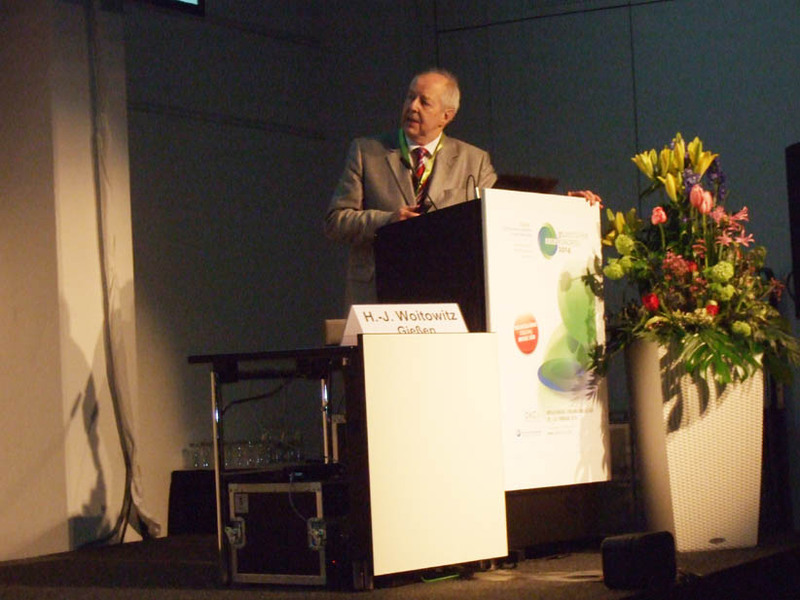 Asbestos issues were also considered at the Congress during a three-hour afternoon session entitled: Onkologische Bedrohung durch Asbest und die Folgen [Oncological threat posed by asbestos and the consequences]. At the end of this session, the Declaration of Berlin was adopted by almost unanimous approval; two negative votes were cast by representatives of the Berufsgenossenschaften (the German Employer's Liability Insurance Agency). 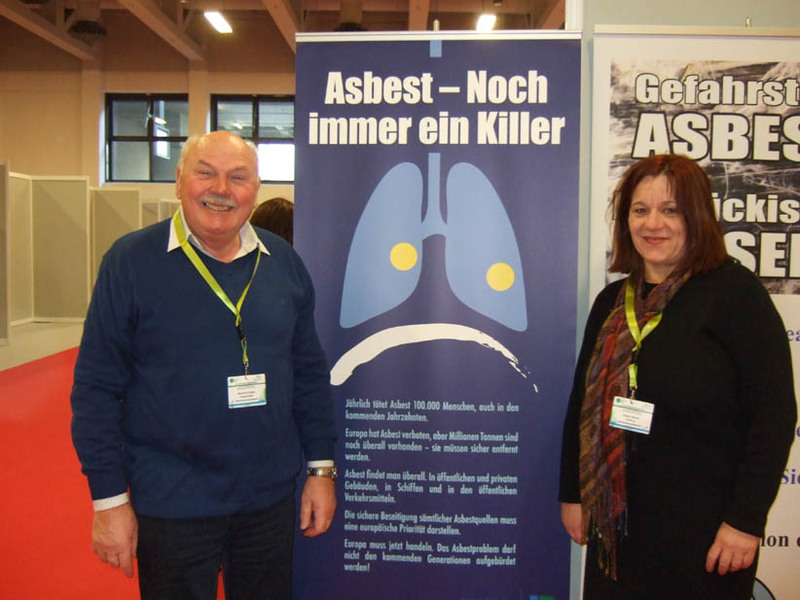 Support for this document was also forthcoming from Germany's two largest trade unions as well as the European Federation of Building and Woodworkers, the Union of Cancer Control, the International Ban Asbestos Secretariat and other groups. The Declaration asks the German Government to support victims in their struggle to obtain their human rights: the right to have their asbestos-related occupational disease recognized and the right to be compensated for their disease. Specific actions were requested including transferring the burden of proof from the victims to negligent employers or their insurers, downgrading the importance of asbestos fiber counts of lung tissue, recognizing cases of asbestos-related diseases amongst people with household exposure and prioritizing the value of detailed occupational asbestos exposure histories [see:Declaration of Berlin: English version; German version]. 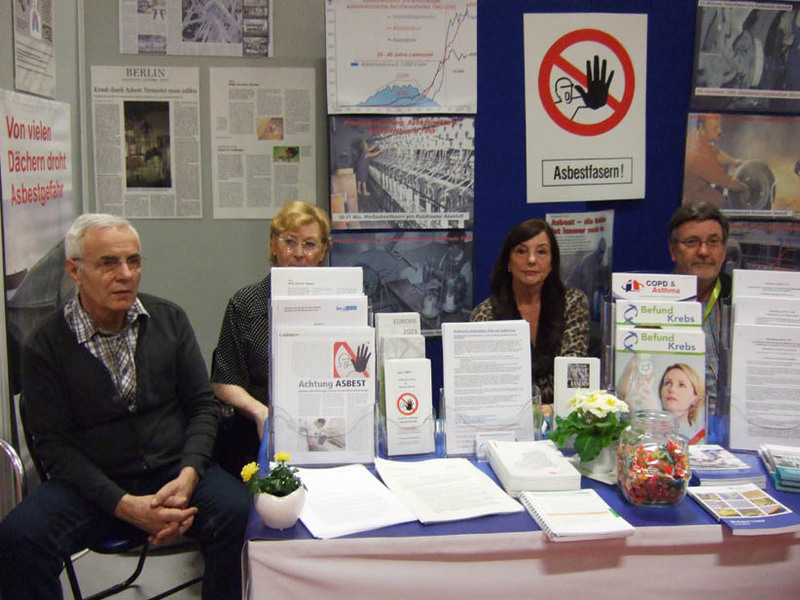 As well as organizing the symposium, throughout the three-day Congress the victims' had a stand in the Congress foyer which was the focal point for the dissemination of information and discussions regarding the status quo in Germany. 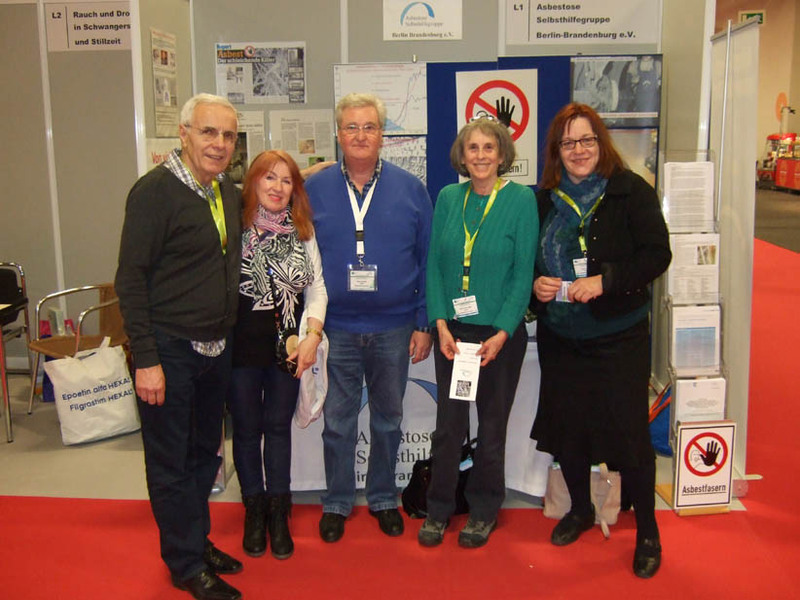 Members of German victims groups at the asbestos booth at the 2014 German Cancer Congress. 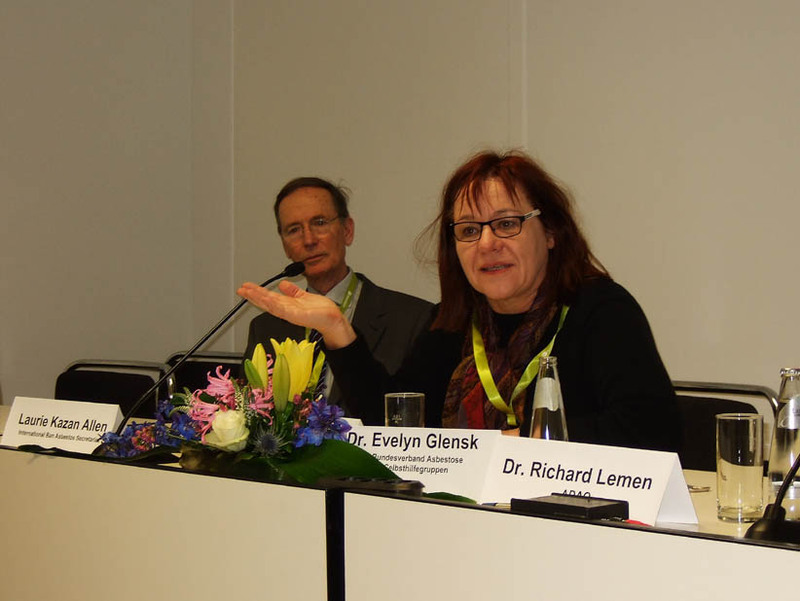 Manfred Clasen, Chairman of the German Federal Association of Victims Groups, and Dr. Evelyn Glensk, Member of the Board of the German Federal Association of Victims Groups (International and Public Affairs). Members of asbestos victims' groups greeting IBAS Coordinator Laurie Kazan-Allen. 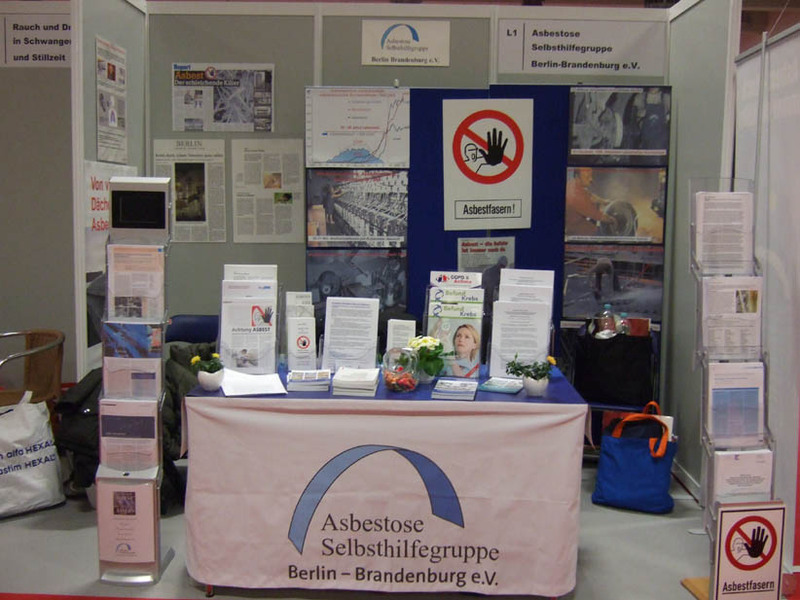 Asbestos booth at the 2014 German Cancer Congress. 1 German asbestos consumption data is from the United States Geological Survey. According to the WHO, between 1994 and 2008, there were 9,569 mesothelioma deaths in Germany. 3 Woitowitz, Hans-Joachim. Asbestos-related lung cancer in Germany: is compensation practice in accordance with the epidemiological findings? 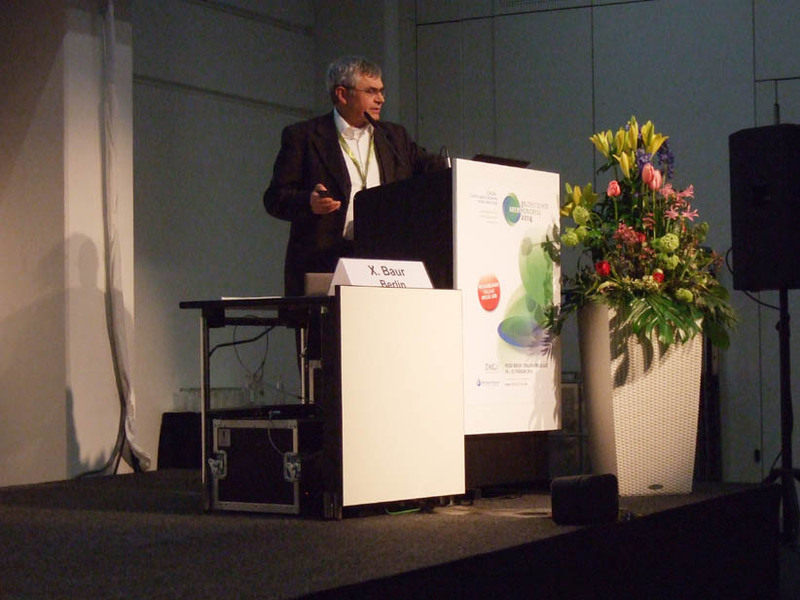 Paper presented at the German Cancer Congress, February 21, 2014.